The couple that reads together stays together! If you want to have a literary-themed wedding, check out the DIY book decorations and other book-inspired crafts in the Book Lover's Wedding Theme guide. If you are looking for general book-themed crafts and ideas, you will find tons of crafts with books, book page flowers, and other creative ways to bring the written word into your big day. There are also a variety of literary-themed wedding ideas, too. From The Great Gatsby to Pride and Prejudice and Alice in Wonderland, you will be able to easily browse gorgeous book-themed wedding ideas. Whether you decide to channel your inner Daisy Buchannan or step into a fairytale wonderland, we know that you will look as lovely as the stories that inspired your theme. Scroll through the list of DIY wedding inspiration for book lover’s and find the craft you need to recreate your favorite story on your special day. There's even a bonus at the bottom for a wedding shower with a classic literary theme. Are you looking for more wedding ideas? 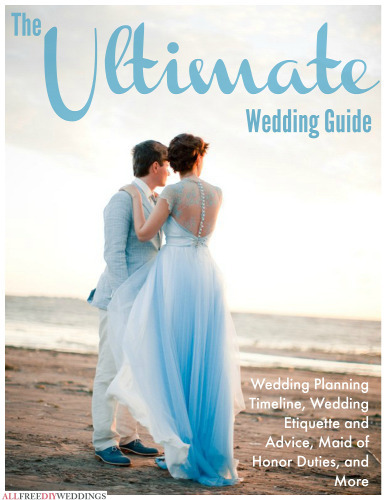 Find everything you need in The Ultimate Wedding Guide: Wedding Planning Timeline, Wedding Etiquette and Advice, Maid of Honor Duties, and More eBook. Hello, old sport! Throw a grand party that would make Jay Gatsby proud when you plan a 1920s-inspired ball for your reception. Take a glance at Gatsby’s look book for inspiration, decorative crafts, favors, and other Great Gatsby wedding ideas. You don’t have to be Grimm to love fairytales! 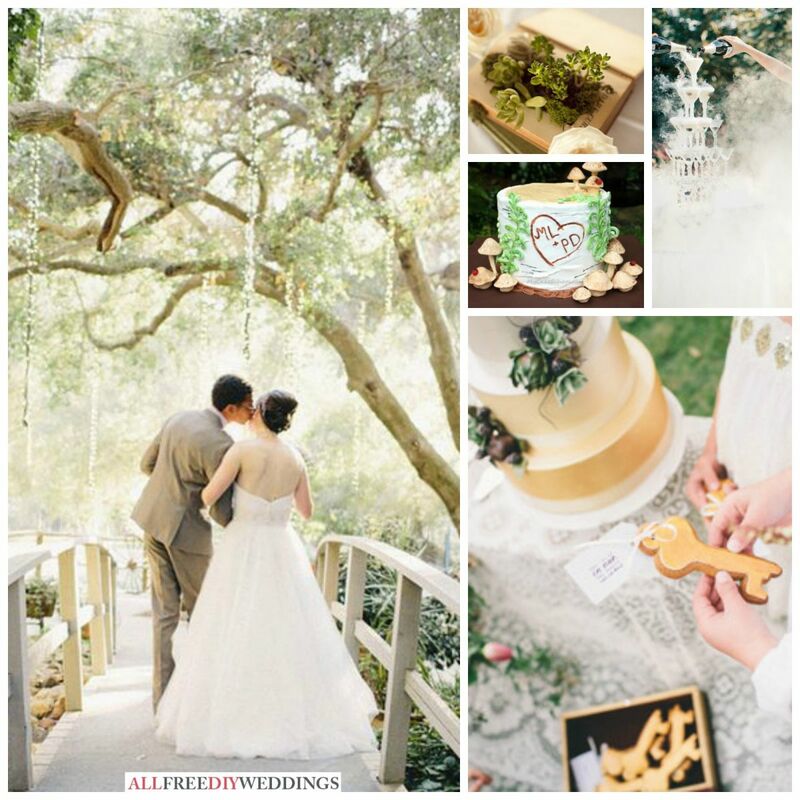 Find fairytale wedding ideas here that will help you create the wedding from your wildest fantasies. Invite your guests down the rabbit hole and into your own wedding wonderland with these dreamy and fantastic crafts. So you’ve booked the church, found your reception hall, and decided on your guest list. What’s next?! Why, decorations, of course! Here you will find all the decorations a bookworm or a word nerd could possibly desire. From table decorations to centerpieces, find the book-themed craft you need to make your special day look like the weddings you have always read about. Your guests will be so excited to see you and your significant other living out your literary-themed wedding dreams. Take a look around for invitation ideas, book-themed favors, and more to make your special day an unforgettable love story your guests can be a part of. If you liked this article and are looking for more magical wedding ideas, check out the Wedding Themes: Fairytale Wedding guide. Throw a romantic wedding shower for your favorite bookworm bride with these awesome Jane Austen-inspired craft ideas. This ebook is a wonderfully helpful wedding planner. I have seen so many things that I can use at both my wedding and my nieces wedding. Hers is a Summer and mine is a Winter ceremony. So there are things in here we can noth use. I found things even bridal magazines don't show! I love to read and would love to incorporate a couple of these ideas into my wedding! I especially like the Jane Austen theme for a wedding shower. These are such great ideas! I especially love the Jane Austen wedding shower idea. So many great ideas for couples who love to read! I especially love the paper flowers. I love these ideas. My cousin got married a couple of years ago and both of them love books. The groom's cake looked like a stack of books and it was so cool. They also used books as centerpieces at the tables. So simple and yet so beautiful.